The weekend’s wildlife highlights were; Minke whale, many Common Dolphin and 20++ Harbour Porpoise mostly feeding a mile or so offshore with an attendant “frenzy” of seabirds! Oddly this frenzy is mostly Shearwaters – over 2000 Manx, up to 100 Great (counted from Gwennap Head), c.200 Cory’s , 50++ Sooty, and increasing numbers of Balearic Shearwaters – 5 from our Minack trip on Sunday evening. There are relatively few Gannets associating with this frenzy which implies the birds are feeding on small prey such as sand-eel or fry, fine for the Minke Whales but unusual for dolphins. A few presumed Blue-fin Tuna have been feeding in the same area and, although still not numerous, Ocean Sunfish are increasing again with 4 on Sunday. Seabird numbers continue to be impressive! Out of the totals mentioned above we have managed to see 3 Cory’s, 2 Great, 5 Sooty, and 5 Balearic Shearwaters amongst the 100s of Manx on the Minack trip, a few Storm Petrels are still appearing well inshore and we saw over 20 following a returning “day-boat” on our 3pm cruise. Although not many are off towards Land’s End 100s of Gannets are still in the Bay area though lately further east off the Lizard. Auk numbers have dropped sharply as the adults are now taking newly fledged young to safety offshore. Skuas are still scarce with only a couple of Bonxies (Great Skua) harassing the shearwater flocks, and although a few Sandwich Terns and Kittiwakes are in the bay there has been little movement so far. Great Northern Divers and the mad/sad Eider drake are still with us, and small flocks of Common Scoter are still passing with over 30 this weekend. A couple of Yellow-legged Gulls are still arriving , but since the strong westerlies have set in there have been fewer Mediterranean gulls. The Grey Seals are slowly building in numbers on St Clement’s Island again, but we still see too many kayakers getting too close and disturbing them- 2 people even had to be taken off the island by the lifeboat apparently! Wader numbers are already building with Curlew, Whimbrel, Oystercatcher, Turnstone, Dunlin, an early Purple Sandpiper and Common Sandpipers all roosting on the island so this disturbance is even less welcome! All in all it has been excellent for so early in the season and we even had a report of a Basking Shark from one lucky observer on the 1pm fishing trip! So even though the weather isn’t exactly scorching, the marine wildlife is certainly heating up! Wildlife and bird sightings so far this year. Spring continues to be a bit of a mixed-bag in the Bay. We have had worse weather lately than we saw for much of the winter and sea temperatures are lower than this time last year. As a result we have not managed to get out as much as we’d like and there are major differences in what we are managing to find! 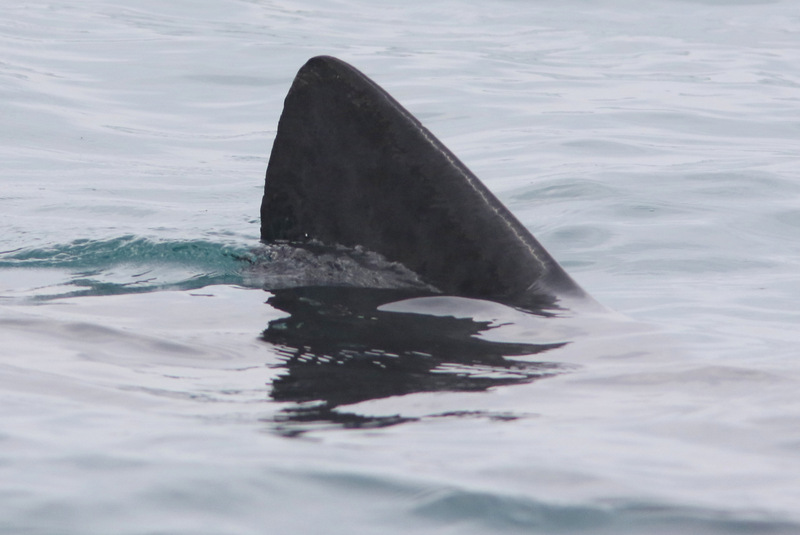 The lack of jellyfish and sunfish is presumably due to the colder water and less extensive plankton blooms, but on the upside we have seen several Basking Sharks – probably for the same reason- which is a vast improvement on the last two years. Common Dolphins have remained offshore, now in smaller pods, and the less predictable group of Bottlenosed Dolphins have put in welcome performances off the Mount in the eel-grass, hunting cuttlefish. Risso’s Dolphins haven’t done that this May, and Porpoise have only been further west out of the bay. It is tempting to think the latter may be avoiding the Bottlenoses , but choppy weather always makes Porpoises harder to see. Sea-birds have been more predictable with the usual resident Fulmars, non-breeding Gannets, auks and Manx Shearwaters regularly feeding in the Bay, though we have yet to see Storm Petrel. Puffins have been scarce. Recent strong winds pushed in a few migrating skuas and an early – or late – Balearic Shearwater! There were fewer sea-birds generally as the winds were more easterly – even producing more Swifts and Swallows arriving on migration than the hoped for skuas and terns. 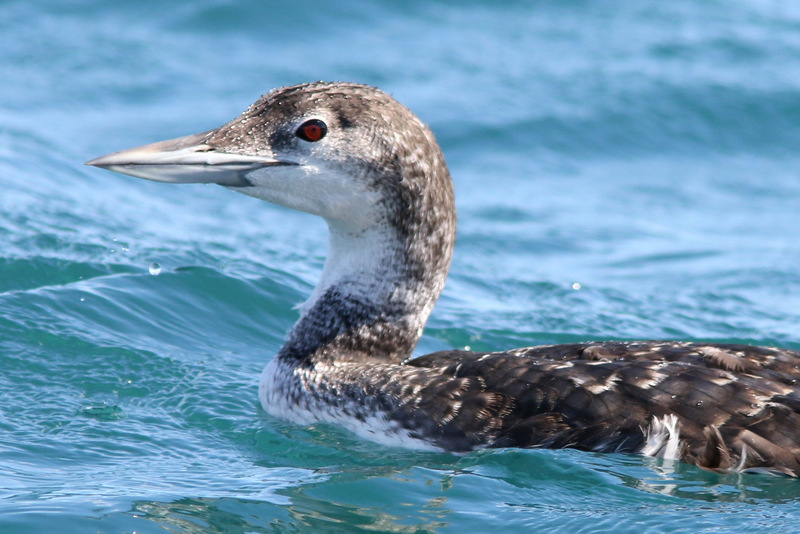 As last year, there are still many “winter visitors” lingering in the bay notably Great Northern Divers, one or two Black-throated Divers and Common Scoter. Our wintering Turnstones have mostly left but a few in stunning summer plumage are still delaying departure for the Arctic as well as over 30 Purple Sandpipers a couple of 100 yards from the Mermaid shop around Battery Rocks, occasionally joined by other waders such as Whimbrel, Dunlin, Sanderling and Common Sandpipers all pushing north. Then there is the Eider….! “Frankie” as some people are calling him (after Frankie Howard “OOOOOaaw!” etc) is still sexually harassing the local black-backed gulls, Greater mostly but he has tried it on with Lessers too! When not eating crabs off the harbour mouth Frankie seems to like nothing better than chasing Great Black-baked Gulls to St Clement’s Island where he serenades and displays to them, and he has even taken to trying to soar over the quarry with the Lesser Black-backed. He has managed to get a response from some of them! Disturbing, sad, or sweet depending on your point of view! Things can only get better……! Penzance Pelagic Trips are back!